The five scratches do change the complexion of this race, but the main players that most interested us have been left in the field. It’s hard to get past the likely favorite, Onus (#8). This filly’s four wins over turf have come by a combined 28 lengths—quite a feat racing on grass. In her first start off the layoff this spring she easily beat a field of allowance company by over five lengths, breaking the course record while hardly being asked for her best. This one-mile distance is perfect for her and her tactical speed should put her in a great position in a race lacking confirmed frontrunners. The only drawback is that she’s not going to get her preferred firm turf course today, which may be a major concern given how disappointing she has been in past attempts over less-than-firm courses. A few runners that contested the local prep race, the Intercontinental, scratched out of the field. However, the two horses that interested us most out of that race will still run. Notte d’Oro (#3) was pace-compromised that day and finished up strongly through the stretch despite failing to make up much ground on the winner. Mississippi Delta (#7) was never fully clear in the stretch last time, having to alter course at the three-sixteenths pole before finding more traffic in the final sixteenth. She’s better than that effort and her tactical speed should have her well-placed towards the front end today. The runner that is likely to offer the best value is MY SWEET GIRL (#6). She’s been more aggressive with blinkers and had to run hard to make the lead last time in a race that featured other speed. She set a fast pace (color-coded in red) and did well to hang on until the final three-sixteenths of a mile. The 118 speed figure that she earned for the effort is the highest last-out number in the field. There shouldn’t be quite as much competition for the front end today and she could find herself sitting a comfortable spot on or near the lead. 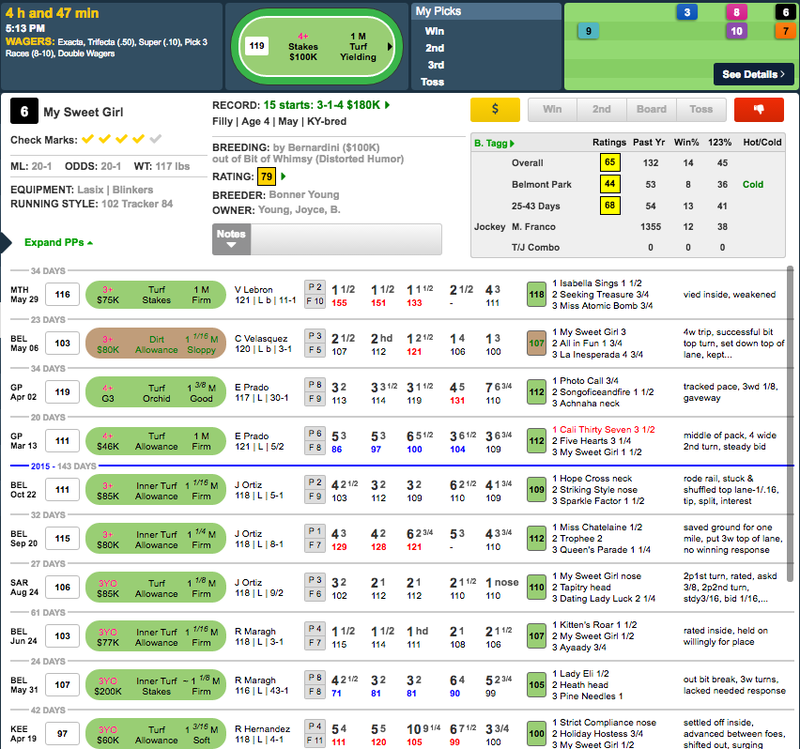 Furthermore, she ran very well over a soft turf course at Keeneland in April of 2015, suggesting that she has no problem with turf courses that have taken some rain, which is what she will encounter today.